Who says Easter Egg hunts are just for Kids ? O'Ryans Village is having their first online Easter egg hunt. Winner gets a free Easter Basket. Its not only easy but fun. The Easter Egg hunt will begin on 4/11/11 and end on 4/13/11. The eggs will be placed by noon CST on 4/11/11. All entries must be received by 9:00 PM CST on 4/13/11. All you have to do is search through our old time nostalgic candy pages to find the hidden eggs. We have hidden 26 eggs though out our candy store that look like this. O'Ryans Village. In the subject line put Easter Egg Hunt and then list the pages you found the eggs on. 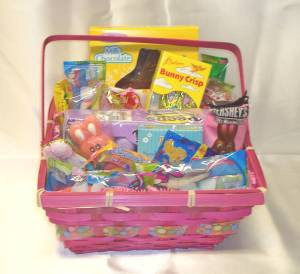 One lucky winner will receive one of our great Easter baskets. How great would that be to win a free Easter Basket ? We can ship the Easter basket to you or any recipient of your choice in the continental United States with a personal gift message included. Well I think everyone had fun with our first online Easter Egg Hunt. The recipient of the Easter Basket according to his mother enjoyed it very much.